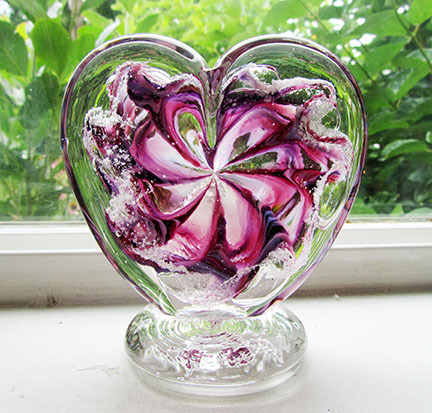 Have the ashes of your loved ones fused inside a piece of glass for a one-of-a-kind memorial keepsake! Ashes typically look like a white or gray powder that gets sprinkled and swirled in with the colors. Any of the paperweights and the round swirl pendants best 'show off' the ashes, but other items can have ashes fused inside. They just may not be as visible. Ship your ashes to me, your custom piece is made, and I will ship the item and left over ashes back to you! Wait time varies between 10-14 business days upon receiving the ashes. Send an email with the shapes and colors you are interested in and I will send you a price quote. Its recommended to set up an appointment if you are placing an order in store. Please have an idea of shapes and colors you are interested in, prior to coming in store.